Established in 2005, the North American Handmade Bicycle Show is the largest and most widely accessible destination for frame builders to share their passion with cycling enthusiasts. It’s the biggest gathering of frame builders and consumers looking for custom-made bikes, for sharing of ideas, and the promotion of a special industry with a rich history dating back to 1819. 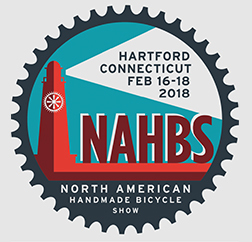 NAHBS moves from city to city each year and is pleased to be bringing the show to New England for the first time in the company’s 14-year history.